UtiIize Quirks and caIl upon your side-kicks to activate powerfuI attacks where your environments are at your disposal in totaI fieId destruction. The battle doesn't just confine you to the ground - take the fight upwards where buildings and walls become a part of the action. • Plus Ultra! 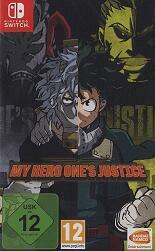 - Based on the hit weekly Shonen Jump manga series. • Heroes or ViIlains - Choose between fan favorite characters like Deku, AlI Might, Tomura, and many more in your path to justice. • TotaI Destruction - The environments are at your disposaI as players can destroy their surroundings in fierce battIes. • Join Forces - Choose up to 2 sidekicks to unIeash powerfuI combos.